Bayfield fishing charter Captain Tom, owner/operator of Superior Sport Fishing has been a professional guide for ten years on western Lake Superior. Prior to becoming a Coast Guard captain in 2010. Tom spent his time tournament fishing on the Great Lakes and inland Minnesota for trout, salmon and walleye. 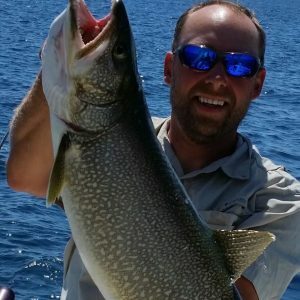 Over the years he has chased game fish all over Lake Superior and Lake Michigan. All the while executing proven competition winning tactics to fill his coolers. In addition to being an accomplished fisherman. Tom is also a Coast Guard Certified Captain and a Board Member of the Duluth Sail & Power Squadron which puts your safety as our first concern. Outside of the Bayfield fishing charter season, Captain Tom works as a chef. Over the years he has been featured in local and national publications. Be sure to ask him for some of his recipe’s before departing for the day. Success is more than catching the fish, the true test is how it tastes at the end of the day! Captain Jim is becoming one of the most knowledgeable captain’s in the Bayfield fishing charter fleet. 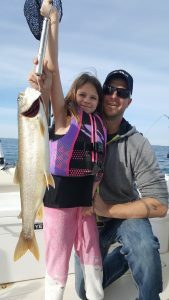 With years of experience fishing with other local elite’s he has gained valuable knowledge of the Apostle Islands fishery. Captain Jim, is also a accomplished tournament fisherman. Over the years he has won and placed in many of the local Lake Superior tournaments. Based in Red Cliff right next to the Reel Nauti, his boat the SBK Reloaded is a 29′ Tiara Open with all of the rigging to put fish in the box. Jim’s experience, matched with a solid, comfortable boat made him the perfect match to partner with Superior Sport Fishing. At the end of the day, two heads are better than one! Our combined time on the water allows us to know where the fish are and what they want. If you are looking to book a Bayfield charter fishing trip, don’t delay, our trips book out quick once the ice starts to thaw.